University of Chicago Booth School of Business is a world-renowned business school located in Hyde Park and Downtown Chicago where many faculty have been awarded Nobel Prices. The University prides themselves on reliable, intuitive, cutting edge technology integrated throughout their campuses. 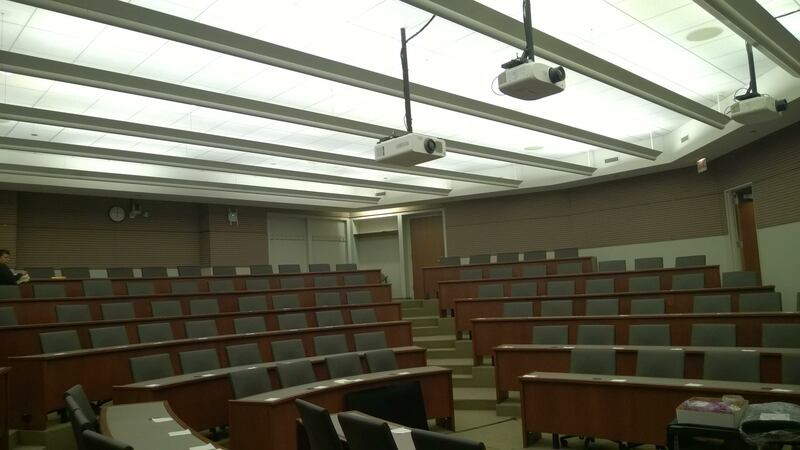 Prior to this overhaul, though, the Lecture Capture and Control Room back bones for both the Gleacher Center and Harper Centers were standard definition, cumbersome to use, and on an analog backbone where modern digital technologies struggled to interface properly. Pace Systems faced the above challenges head on with “future forward thinking”, proposing solutions to minimize cost of future upgrades. The final solution was to provision a completely HD, fiber based infrastructure, head end, and control system that would allow University of Chicago to allow any room in any campus (including overseas) to interface with each other instantly. Pace provided a hands on, collaborative approach working closely with the University to make this a reality on all of the UC Booth campuses. Pace built a fully digital, fiber based Lecture Capture System with Control Room that allows over 35 Classrooms to be recorded and distributed simultaneously. UC Booth now uses this for lectures, keynote speakers, and instructors to be broadcast live with virtually no lag to all of their campuses, including those in London and Hong Kong. The University of Chicago Booth School of Business and Pace Systems are now acting as partners to continually enhance the school in additional ways.